She Loves Me is a sweet comedy musical about a man and a woman who share romantic letters and fall in love even though they’ve never met. The twist is, of course, that they have met. Georg and Amalia work together at Mr Maraczek’s perfumery store – and what’s more they detest one another from the moment they meet. 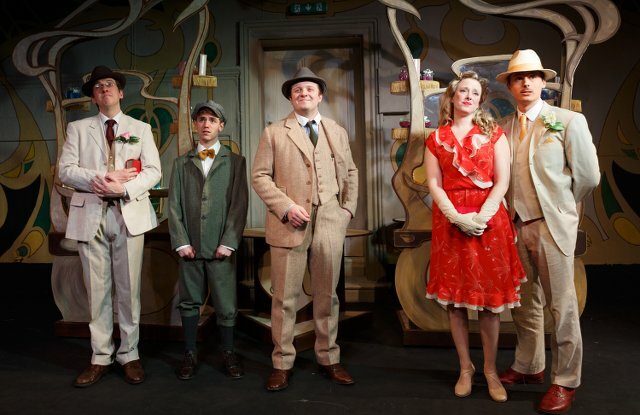 This welcome revival of a feel-good romantic comedy arrives at the Landor just in time for Valentine’s Day. This production keeps the original 1930s Hungarian setting, and feels richer for it, since the design work is sumptuous, and the days of instant communication leave the story unlikely (despite the best efforts of the movie You’ve Got Mail to modernise it) to work in the present day. The music is brought to life by three musicians on string and piano, and this is enough for the intimate Landor, where the human voice acts as the forth instrument. Recording artist Charlotte Jaconelli is making her musical debut in this production, and the romantic lead of Amalia is a challenging place to start, but it’s a part that plays to her strengths. Jaconelli’s voice is excellent, and her performance has emotional credibility. She is paired off well against John Sandberg as Georg, who excels at playing the affable everyman. The chemistry between them is completely believable, and one of the best aspects of the production is that the lead actors create characters and a scenario you care about. The supporting cast is excellent too: Joshua LeClair wins a lot of laughs as the loveable Arpad, whilst Matthew Wellman, complete with Ronald Colman moustache, relishes playing a cad. Emily Lynne is very funny as the idealistically romantic Ilona, and David Herzog has a nice line in the dryly ironic. On scene-stealing form though is Ian Dring, who brings warmth to the part of the elderly Mr Maraczek, but is outstandingly funny later on as the snooty waiter who wishes to maintain a romantic atmosphere in his insalubrious café. The biggest issue with She Loves Me stems from the original source material, which is long and unfocussed. 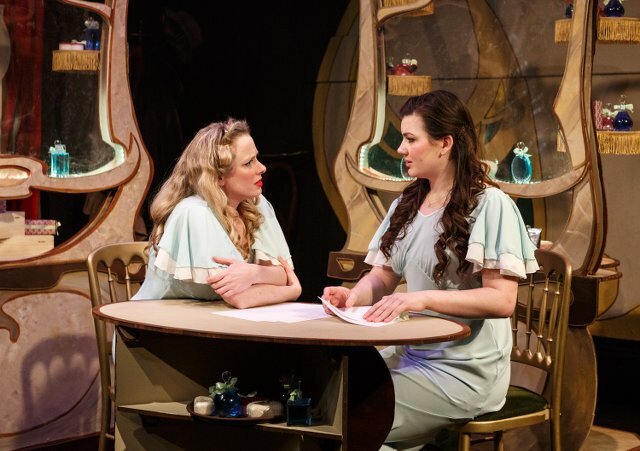 Whilst it’s good that the shop assistants at Maraczek’s emporium are fleshed out and have lives of their own, there are too many songs for supporting characters, and ultimately there’s so much going on in multiple subplots that it takes attention away from the relationship between Georg and Amalia. A near-three hour running time feels too long for a simple romantic comedy (even Robert McWhir’s snappy direction doesn’t annihilate the issue), yet despite that, the ending feels rushed and (avoiding spoilers) unconvincing. For a well-known musical there are few melodies that make a strong impression, with perhaps the Latin-inspired A Romantic Atmosphere and Tango Tragique at the climax of the first act the most likely to lodge in the mind. This production is definitely worth seeing for a revival of a good, if not great musical. However, such an undeniably sweet and heart-warming romance is ideal fodder for lovers as Valentine’s Day looms.